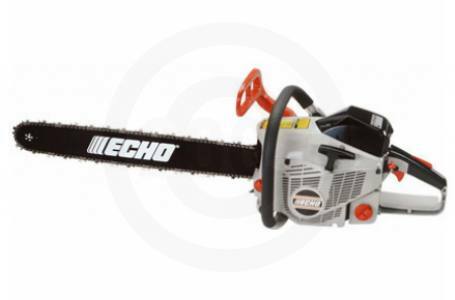 The professional choice for power and reliability, all ECHO chain saws are built to tackle the toughest jobs. Whether you're logging, felling, or limbing, each ECHO saw is designed to provide long, trouble-free life. Superior balance, outstanding control, and vibration reduction technology make ECHO chain saws a comfortable saw, but with power to perform the task required. ECHO's most popular felling saw delivers excellent speed and reliability for enhanced productivity. 66.7 cc high performance, 2-stroke engine. Standard 24" bar and chain with tip guard included. Optional 16", 20" and 27" bars and chains available. Replaceable bumper spikes improve control for easier cutting. Engine Displacement (ci. ): 4.07 ci. STD Bar Length: 24 in. OPT Bar Length: 16 in. 20 in. 27 in. Fuel Capacity: 22.5 fl. oz. Oil Capacity: 13 fl. oz. Dry Weight: Without bar and chain. STD: 24 in. ; OPT: 16 in., 20 in., 27 in.